Old Persian booked his place in the William Hill St Leger with victory in this Group Two prize, while the Melbourne Cup beckons for the runner-up, Cross Counter. Nelson set a decent gallop in the early stages, with Wells Farhh Go, Old Persian and Cross Counter not too far away. The race was wide open three furlongs out, where Wells Farhh Go was the first to commit, but the Godolphin pair soon dominated proceedings. Sent off at 7-1, Old Persian kept finding for James Doyle and returned to the form of his win in the King Edward VII Stakes, following defeat in the Irish Derby, as he kept his stablemate at bay by a head. The Aidan O’Brien-trained Kew Gardens made up plenty of ground from the rear to take third place, a length and a half away. Winning trainer Appleby said: “The two horses came here in great order. I put a line through Old Persian’s run in the Irish Derby. We might have backed up quick enough after Royal Ascot, but I always felt the horse was going there in great order. “It was more the fact the race didn’t pan out as we expected as they slowed up in front and we weren’t in the right position. “The horse needed a break from there and he had a nice, little break. The team have got him back well and we were confident coming into today. He’s bred to get a trip and he galloped out strongly. He added: “I think we have a nice team going down to Australia, but it just depends how well they travel. Kevin Buckley, Coolmore’s UK representative, said of Kew Gardens: “He’s run a great race, he’s just been beaten by the penalty. “It’s nice to see him come back from his little break after his race in France in such good form. “He should step up on that perfectly in time for Town Moor (Leger). Tim Easterby said of Wells Farhh Go, who was fourth: “I’m very happy with that, he just needs one-mile-six or two miles on soft ground and he’ll win. “Back on quicker ground and over a mile and a half he’s just been found out today – when he was asked to quicken he was just climbing a bit. “The first three all look like they’ll improve for going up in trip, to be fair. The Great Voltigeur Stakes is named after Voltigeur, the Yorkshire-trained winner of the Derby and St Leger in 1850. It was first run in 1950, and it was initially called the Voltigeur Stakes. The word "Great" was added to the title in 1957. The Great Voltigeur Stakes serves as a trial for the following month's St Leger, and thirteen horses have achieved victory in both races. The first was Premonition in 1953, and the most recent was Lucarno in 2007. 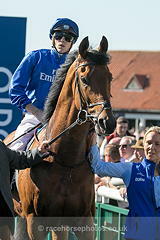 The last participant to subsequently win the St Leger was Encke, third in 2012. The event is currently held on the opening day of York's four-day Ebor Festival meeting.